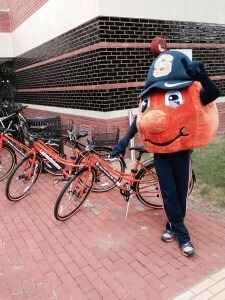 We’ve been working with Syracuse University’s Student Association for a while on this, and we are so happy to announce the success of SU’s Bike Share pilot program! The bikes are the awesome step-thru commuter Kona Coco that we had powder-coated the obligatory SU orange, and outfitted with rear racks and baskets, dynamo lights, wheel locks and u-locks. We love this bike for commuting. It’s lightweight aluminum frame has a comfy yet zippy feel, and it comes equipped with disc brakes and fenders, perfect for Syracuse weather. With 9-speeds, it’s super simple and low-maintenance. The chainring has a built-in guard help prevent pants tangles. We also love installing dynamo lights — makes us feel for a moment like we’re in Amsterdam or Copenhagen! Such a low-maintenance option. They’re always on and you never have to worry about batteries because they’re powered by magnets! If you’re not a student, stop by the shop and give the Kona Coco a test ride today!